Looking for a tyre centre that carries out repairs efficiently and to the highest safety standards? Look no further than Mulvey Tyres of Roscrea, Co Tipperary. They provide competitive prices, engaging advice and a team of experts dedicated to looking after the safety of your vehicle. 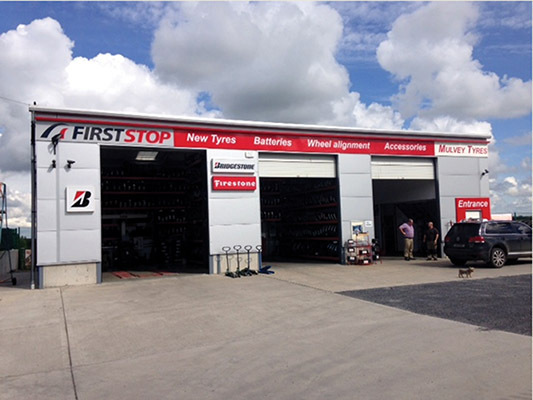 A member of the First Stop European wide network of tyre service providers, Mulvey Tyres is a family run business with over 30 years experience and they provide a wide range of tyres at competitive prices. At present, First Stop have 2,000 service centres in 25 countries across Europe. This impressive growth has always been led by one ambition: to offer their customers the best service, produce and advice on tyres and vehicles. These are traits that are synonymous with Mulvey Tyres. James Mulvey's involvement in the tyre trade stretches back over 37 years and he and his wife Margaret joined forces with First Stop seven years ago. Tyres are the only contact between you and the road. They ensure the safety of you and your family on the road, they make sure you have the right tyres fitted to deal with any situation that might arise. Open Monday to Friday (9am-6pm) and Saturday (9am-5pm), Mulvey Tyres offer a full range of tyres from all leading manufacturers, within each budget category, to give their customers the best choice according to their needs. First Stop specialists, such as Mulvey Tyres, have received in-depth training and are professionals in their field. As a result, there is no great secret to their continued growth, according to Margaret. She deflected all the credit for that on to their two experienced fitters, Jimmy Kelly and David Kennedy, who, like James, boasts a wealth of experience in the industry. “No come backs, customer satisfaction –that's one of our main priorities,”she stressed. “Customers keep coming back to us because of our fitters and the way they conduct sales with them. They always take the time to explain, for example, how many more miles they can expect to get out of a tyre. “Safety is, of course, another top priority and, whether or not the customer deals with us, they will always set them straight on when they need to replace their tyres to ensure the safety of the vehicle. Our fitters are fully trained in all aspects of Health & Safety. Mulvey Tyres' valued customers regularly avail of the following services: alignment (front & rear axle), all-in fitting of new tyres, including valve change & balancing, and tyre rotation. Correct wheel alignment makes sure your car drives and handles safely without unduly stressing the tyres or other suspension components while a regular rotation of the wheels ensures a uniform wear of the tyres and a consistent performance in the vehicle. In addition to tyres, Mulvey Tyres also apply their expertise to a wide range of other services, such as oil changes, batteries, electronic vehicle diagnostics, brakes, the exhaust, the shock absorbers etc. James and Margaret and their team are committed to a professional approach and their expertise helps to guarantee your safety on the road. 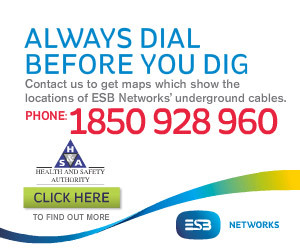 They specialise in high-quality services, equipment and products from leading brands. When it comes to tyres, Mulvey Tyres and First Stop should be your first choice!